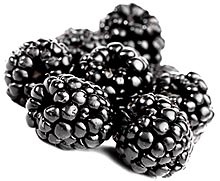 Blackberries contain salicylate, a natural pain reliever that may help lower the risk of heart disease. Rich in antioxidants, blackberries also help the body in fighting free radicals and thus avoid various types of cancer, especially breast and cervical cancer. The presence of large amounts of tannins that give blackberry roots and leaves an astringent effect useful for treating diarrhea are also helpful for soothing sore throats. A decoction of the leaves is useful as a gargle in treating thrush and also makes a good general mouthwash. The chewing of the leaves for bleeding gums goes back 2,000 years. This fruit is a good source of vitamin, folate, magnesium, potassium and copper, and a very good source of dietary fiber, vitamin C, vitamin K and manganese.